This page features a free printable Map Of Wisconsin. 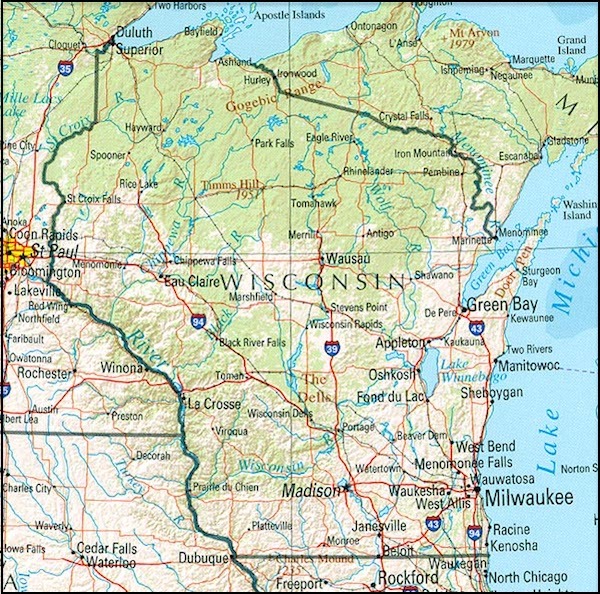 The above US map shows the location of the state of Wisconsin in relation to other US states. 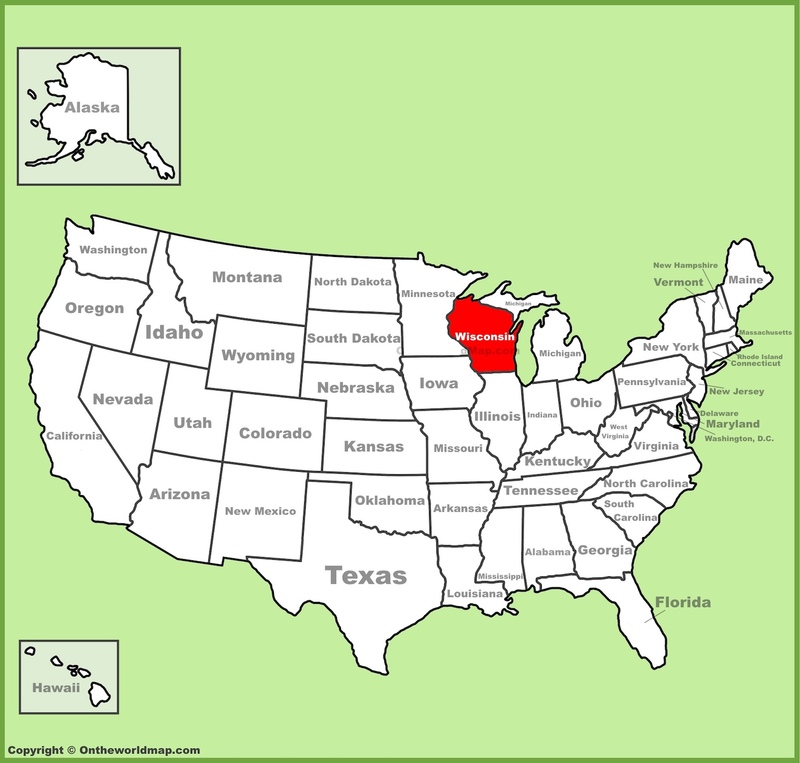 On May 29th of 1848, Wisconsin became the 30th of 50 states admitted to the Union. Scroll down to find a Map Of Wisconsin, along with fascinating facts about the state. Wisconsin produces more ginseng than any other US state. The state of Wisconsin is home to well over 16,000 lakes. The oldest existing city in Wisconsin is Green Bay, established in 1634. The state of Wisconsin is known as The Swiss Cheese Capital Of The World. The electric guitar was invented in Wisconsin by Les Paul, also known as The Wizard of Waukesha. The first person to play an electric guitar in a concert was a man from Hibbing, Minnesota named Bob Dylan. Wisconsin is also a major contributor to cinema - The great writer, producer, director, and award-winning filmmaker Orson Welles was born in Kenosha. Hayward is home to the National Freshwater Fishing Hall Of Fame. America's first hydroelectric plant was built at Fox River. The typewriter was invented in Milwaukee in 1867. The 10 largest cities in Wisconsin (by population size) are Milwaukee, Madison, Green Bay, Kenosha, Racine, Appleton, Waukesha, Eau Claire, Oshkosh, and Janesville, in that order. Above: A detailed Map Of Wisconsin.